Preachers and â€œNumbersâ€ have had a long sordid history. There are those who when they first discover that you are a â€œministerâ€ or â€œpastorâ€ they immediately ask, â€œso how many are you running?â€ (i.e. how many do you have in attendance on a typical Sunday morning). In their minds they are evaluating your worth, your faithfulness, your talent, everything about you by the number that comes out of your mouth to answer their question. Ask yourself, â€œWho is invited to preach at seminary campuses, various seminars, or large churches?â€ Is it not those who have experienced explosive growth, those that pastor large churches, or have released a book or some resource that has sold a bizillion of copies? These people are â€œsuccessfulâ€ and if you are to be â€œsuccessfulâ€ in ministry then you should emulate them. At pastorâ€™s lunches or gatherings, when we are all alone with our own, we look over the group and measure our worth and judge our order amongst ourselves. We are a cruel and heartless bunch, we pastors. Over the years, when my church or ministry was growing I felt successful, and when it decreased I would feel like a failure. I would pour in the hours, sacrifice financially, and try to do whatever it took to change things. The rise and fall of churches is crushing and exhausting to leaders. Leaders and pastors typically donâ€™t know how to balance their feelings of success or failure with the circumstances around them. They struggle with depression because of the events that transpire around them. On the other side of the discussion are those who for various reasons donâ€™t grow, donâ€™t attract very many, or donâ€™t do much to reach people for Christ. These are the people who say, â€œitâ€™s not about numbers, itâ€™s about being biblical.â€ As if â€œbeing biblicalâ€ is a reason to not change how they operate or think in order to reach out and see people won for Christ. They use this straw man argument to do little for the Lord, to remain inside of a cocoon away from â€œworldyâ€ people and their influence upon their family. Everything the Christian does is to be done for the glory of the Lord, but in order to give Him glory we must be obedient. If we are to be obedient and to be a follower of Christ, then we must do what He did. We are commanded to â€œgo and make disciples.â€ Therefore, growth, new spiritual birth, disciple making, reaching out, etc. . . are important if not required to be true to Christ. Our value is not based on what we do, but on whose we are. Our privilege and honor is that we get to be apart of the plan of redemption of mankind.Â If we are to be apart of His work, there is eternal value in every act. But even as I write these words I am thinking, â€œthatâ€™s what people who donâ€™t see growth, or whose work isnâ€™t seeing any disciples being made say.â€ Thatâ€™s what losers say. We are not called to be “successful” we are called to be “faithful.” But how do you balance what you know Scripture says with what the world (especially the church) says is the measure of success? There are times when God does a mighty work amongst us, or even with us, and we feel awesome, only to shortly thereafter face a difficulty and find ourselves an emotional mess. Â There is a great example of this roller coaster of emotion in 1 Kings 19. So How Should I Deal With the Roller Coaster of Ministry Emotions? 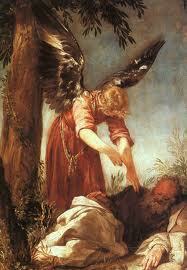 1 Now Ahab told Jezebel everything Elijah had done and how he had killed all the prophets with the sword. 2 So Jezebel sent a messenger to Elijah to say, “May the gods deal with me, be it ever so severely, if by this time tomorrow I do not make your life like that of one of them.” 3 Elijah was afraid and ran for his life. When he came to Beersheba in Judah, he left his servant there, 4 while he himself went a day’s journey into the desert. He came to a broom tree, sat down under it and prayed that he might die. “I have had enough, LORD,” he said. “Take my life; I am no better than my ancestors.” 5 Then he lay down under the tree and fell asleep. All at once an angel touched him and said, “Get up and eat.” 6 He looked around, and there by his head was a cake of bread baked over hot coals, and a jar of water. He ate and drank and then lay down again. 7 The angel of the LORD came back a second time and touched him and said, “Get up and eat, for the journey is too much for you.” 8 So he got up and ate and drank. Strengthened by that food, he traveled forty days and forty nights until he reached Horeb, the mountain of God. 9 There he went into a cave and spent the night. When we look at Elijah in this passage we find him wanting to sleep, hide, get away, and die.Â He fears for his life, he has had enough.Â But how did Elijah get to this point? He had not eaten,Â his focus has changed from eternal to temporal, Â he was physically exhausted, Â he was alone (he left his servant behind), Â he was being introspective and self-pitting (â€œI am no better than my ancestorsâ€), he is living and running in fear. How does God respond? He sent him someone (something) to take care of his needs.Â Elijah needed to eat, so an angel prepared a meal and encouraged him to eat (twice).Â God gave Elijah what he needed to continue, God gave Elijah what he needed to get up, shake of the dust and walk on.Â God provided for Elijah in a way similar to his past.Â Â Ravens miraculously fed him when he was by the stream; here an angel miraculously feeds him in the desert.Â The Lord ministers to him now, just as he did in the past.Â God will provide for you, and give you what you need to make it in ministry. God also recognizes that â€œthe journey is too much for you.â€Â Notice that God does not say, â€œThe journey was too much for you.â€ Elijah has more work to do; his work would go on and on, and on. Because God gave the apostle Paul great visions, and used him in such a special way, he gave Paul what is described as a â€œthorn in the fleshâ€ and when Paul asks God to take it away, 2 Corinthians 12:9 â€œBut he said to me, “My grace is sufficient for you, for my power is made perfect in weakness.” God knows that the journey is too much for us to handle alone, so he gives us his grace, and it is sufficient. Then God speaks to Elijah.Â He asks him a question, â€œWhat are you doing here?â€Â God did not tell Elijah to run away.Â Elijah has just called down fire from heaven, he has slain 450 prophets of Baal.Â Â The people had cried out, â€œThe LORD â€“ he is God!â€Â He won the battle single handedly â€“ he won the day.Â What happened? I believe that Elijah as he stood on Mt. Carmel and saw the fire fall, in his mind thought that that was it â€“ Baalism was beaten, it was over.Â After all these years of ministry the war was finally over. He could rest, go home, be at peace. But now Jezebel is coming after him.Â Another battle, another enemy, another battle, another enemy, another day, on and on, and on â€“ the battle never ends, there is no apparent end to Elijahâ€™s fighting.Â Sometimes when we are on those spiritual mountains we expect to stay there â€“ but ministry has ebb and flow, ups and downs, years of plenty and years of famine. Families still fall apart, children still go wayward, cancer still rips people apart, death still robs families of loved ones, on and on the battle goes. God asks Elijah, â€œWhat are you doing here?â€Â Elijah responds by saying, â€œLord donâ€™t you see whatâ€™s going on here â€“ I have lost!â€Â The people reject your word, they donâ€™t worship you, they kill your prophets, and now Iâ€™m the only one left. They wonâ€™t listen, they wonâ€™t change!â€ â€“ I have failed.Â God responds to Elijah by saying, â€œGo out and stand on the mountain in the presence of the LORD, for the LORD is about to pass by.â€Â God has proven to be God to the people of Israel, and He has proven that he is God to the prophets of Baal â€“ but here he has to show that He is God to His own prophet.Â Sometimes we think itâ€™s all about us, and what we can do, what we can see, what we understand, what we know, etc.â€¦ It is not about what we can do â€“ Itâ€™s all about the God that we serve.Â The God we serve spoke and worlds came into existence, at His word the ground became flesh, at his breath Adam breathed his first breath.Â It is in his thoughts that all the created order is held together. He knows how many hairs are on your head, and he knows the darkest part of your heart.Â His knowledge is eternal, He has always existed in eternal past, He lives today, and will live forever more.Â God alone bore the weight of the cross, He alone loves with a love that endures forever.Â When thisÂ God passes by our lives â€“ everything changes. The God we serve leads us out of slavery, pays our ransom and redeems us.Â He alone can break the chains of sin.Â The Creator controls His creation.Â â€œThen a great and powerful wind tore the mountains apart and shattered the rocks before the LORD, but the LORD was not in the wind. After the wind there was an earthquake, but the LORD was not in the earthquake. 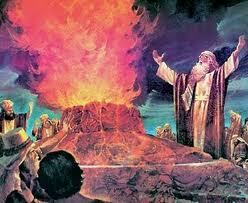 12 After the earthquake came a fire, but the LORD was not in the fire. God controls the wind, the earth, the fire â€“ he is not in these things, He is above them.Â Can Jezebel cause earthquakes, knock down mountains with a wind? Can she consume with fire?Â No â€“ But the God whom she will have to an account can.Â Who is more powerful, God or Jezebel? It says that God was not in the wind, the earthquake, or the fire â€“ God performed even more mighty miracles before Elijah, but God was not in the miracles. 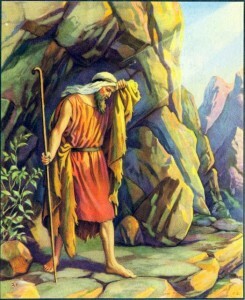 He â€œcame in a gentle whisper.â€ It was Godâ€™s gentle whisper into Elijahâ€™s heart that ministered to him, not the powerful displays.Â God does not always use the miraculous to deliver him from his problems.Â God could wipe out all enemies before Him, but he may also use as whisper into the heart of his servant to show His power.Â In this moment of crisis in Elijahâ€™s life â€“ it is only the word of the Lord that allows him to mend and regain strength. We want to move from miracle to miracle, from mountaintop to mountaintop until we become miracle junkies.Â If we go to a worship service, we want to fire to fall, and the praise band to rock, and the preacher to sweat â€“ we want it loud, and we say, â€œmake me feel something, let me see God do something.â€Â But God says, no I want you to listen, (softer) I want you to listen, let me just talk to your heart.Â I want you to lean in and listen and know that I am God. God asks Elijah the same question, and Elijah gives the same response.Â Perhaps his thinking is that because he is in a cave, maybe God didnâ€™t hear him.Â Godâ€™s display and passing by his life doesnâ€™t seem to change Elijahâ€™s view of his life situation.Â God gives a different response â€“ â€œGoâ€Â (do your job). He gives him a specific task. Anoint men of God â€“ spread the load, itâ€™s not all about you.Â Itâ€™s not all about you being faithful, itâ€™s not all about just you doing ministry, I have a plan that is far larger than you. â€œBut Iâ€™m Elijahâ€ â€“ it will only be successful if I do it.Â No, God is bigger than you, and he has a lot more going on than just you. Anoint a successor â€“ God wants Elijah to take another man who has been called out and invest in his future.Â In Elijahâ€™s life time there will be no â€œdeath blowâ€ to evil, the fight will continue on.Â So he must have someone who has been prepared to take his place when he dies. There are 7,000 who have been faithful. â€“ In other words, you donâ€™t know everything.Â Elijah says, â€œIâ€™m the only one, Iâ€™m the last one left.â€Â God says, â€œoh really, you who know everything â€“ did you know about the 7,000 others?â€Â â€œElijah, just because you canâ€™t see other faithful believers, doesnâ€™t mean that they arenâ€™t there.â€Â Man or woman of God just because you canâ€™t see all the pieces to lifeâ€™s puzzle, doesnâ€™t mean they donâ€™t exist. You only know todayâ€™s chapter, but only God knows what the next chapter of your life holds. It may be high tide, it may be low tide â€“ but God expects us to remain faithful and to keep going. One of the ways that God brings our spirits up is to push us to continue to â€œgo.â€Â Go into the future with the foundation of what God has done in the past. God has fed him the past and has fed him now.Â God has spoken to him in the past, and now has spoken to him now â€“ the fact that he asks him the same question may be that God is asking him what he desires to do in the future. Numbers are valuable because they represent people, but our value is not based on these numbers.Â God is the one at work, He is the one doing the work â€“ we are simply blessed to be along for the ride. Some men of God are used in crystal cathedrals, others only see a handful won for the Lord in a secret place in a dark and oppressive foreign land. Both men are of equal value. Their assignments are different, but their Lord and faithfulness is the same.